I was contacted by the owner of a cleaning company in Milton Keynes, after an end of tenancy clean at a house in Sharnbrook went wrong. 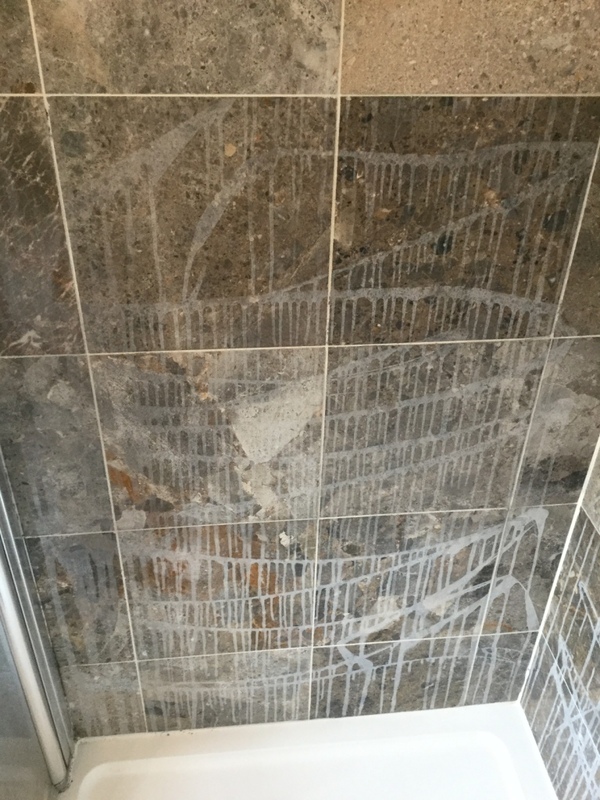 Unfortunately a member of their staff had incorrectly applied an acid based cleaning product to the Marble shower tiles which like most natural stone is acid sensitive. The cleaning product had etched the stone causing the damage you can see below. Being a reputable company they were determined to put the situation right and we were asked to step in. 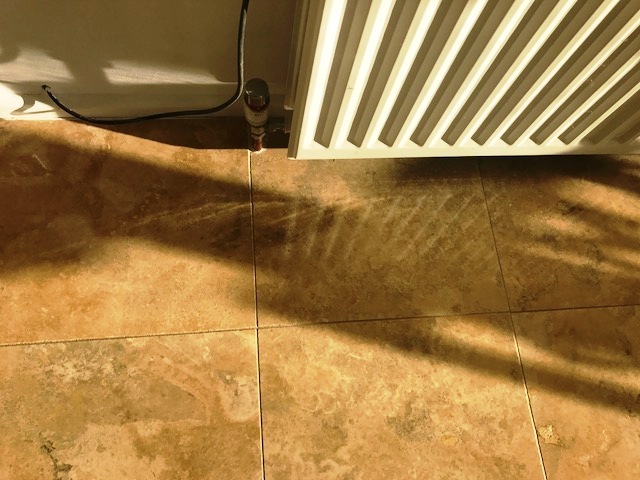 We have had a few issues of this type before where customers keen to remove unsightly Limescale marks from their stone tiles use a household cleaner without reading the bottle label first to see if it’s safe to use. Issues of this nature on Marble cannot be easily resolved with chemical products; it takes specialist knowledge and equipment. The quote was given and accepted and the work was booked in with the letting company for a few weeks later. 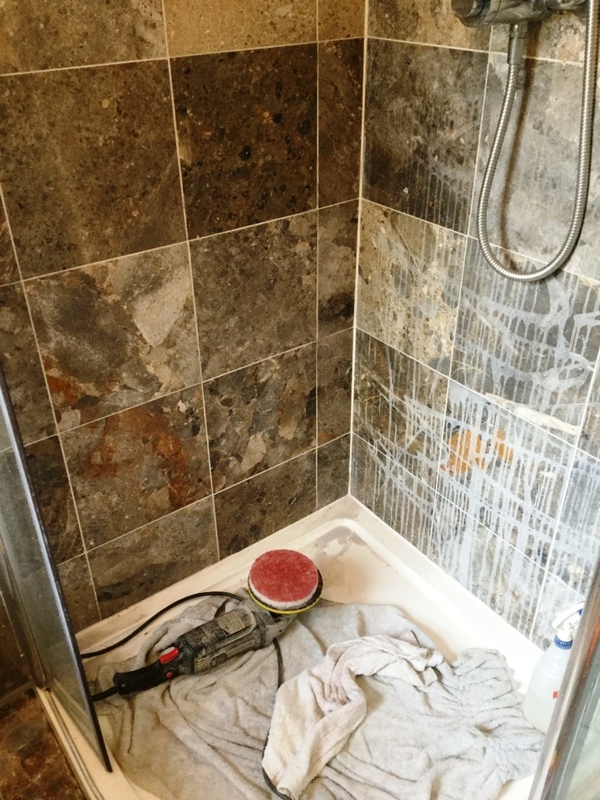 The first photos show the extent of the damage which had not only damaged the immediate area but as the cleaning product was in liquid form it had ran down the wall had totally ruined the surface of the tiles in the lower half of the shower. The first thing I did was to protect the shower tray with towels and then began assembling the equipment needed for this job which consisted of a wet polisher, a variable speed polisher, one set of 6” Tile Doctor burnishing pads from 100 grit to 3,000 grit and one full set of diamond blocks from 80 grit upwards. I then went about testing how far down the scale I would have to go to get the best results. 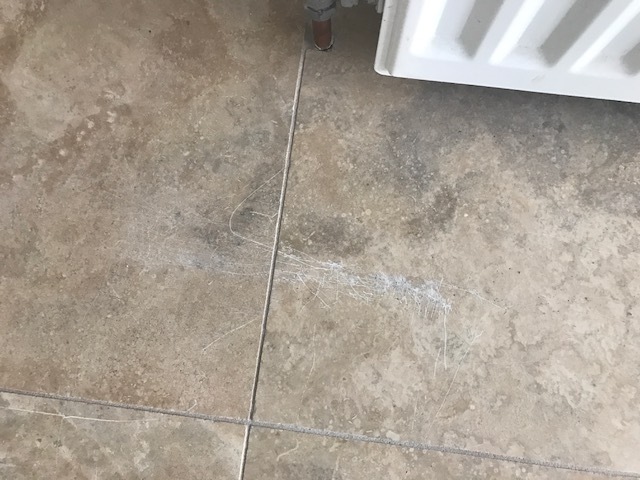 I found that in most areas the application of a 200 grit burnishing pad was adequate to resurface the tile and remove damage but in some areas I had to go down the scale as low as 80 grit to achieve the desired result. One the damage had been removed the higher grit pads are used in sequence to restore the polish finishing with the 3,000 grit pad. No chemicals are used in this process, just water and the small six inch diamond encrusted burnishing pads which fit to a hand buffer. Although only a small area, no more than 4 m2 this job took most of the day. 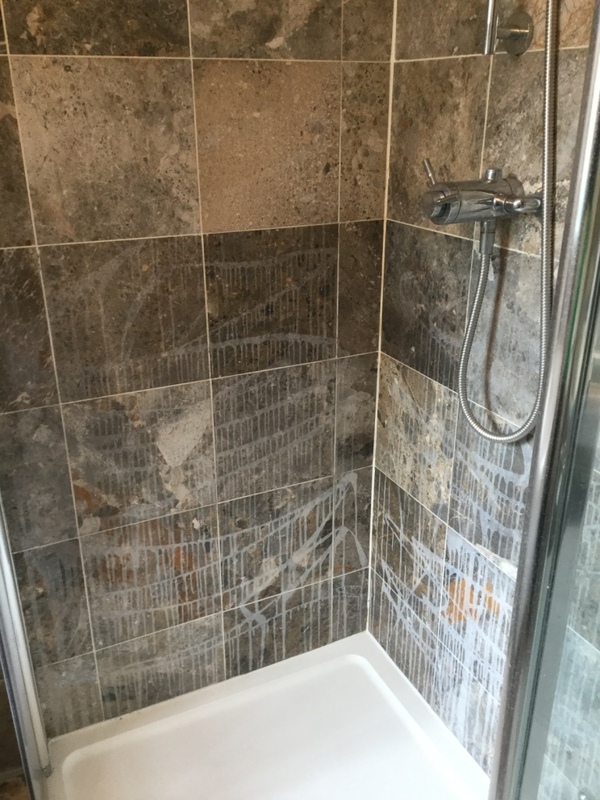 However, as the whole shower room was tiled in the same tiles it was a much more cost effective to restore the damaged tiles than replace them. We were able to achieve an excellent result which the client was very happy with, no doubt saving the cleaning company thousands of pounds in replacement costs. 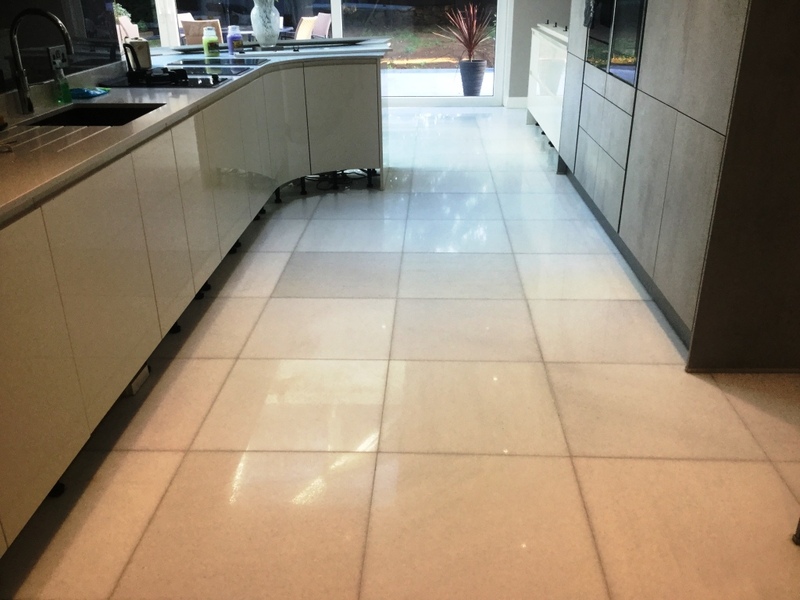 It can be very frustrating to put effort into regularly cleaning natural stone floor tiles without achieving effective, long-lasting results. 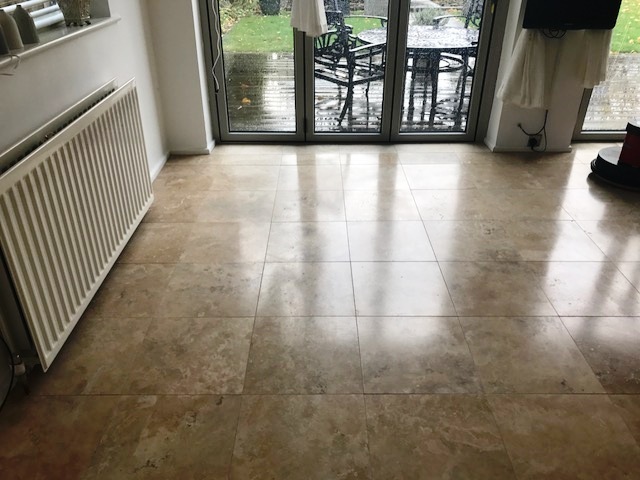 This recent customer of mine, who lives in the beautiful city of Durham in north east England, had attempted to maintain the appearance of her Travertine tiled living room floor but it had, nonetheless, become dull and lifeless in many areas. 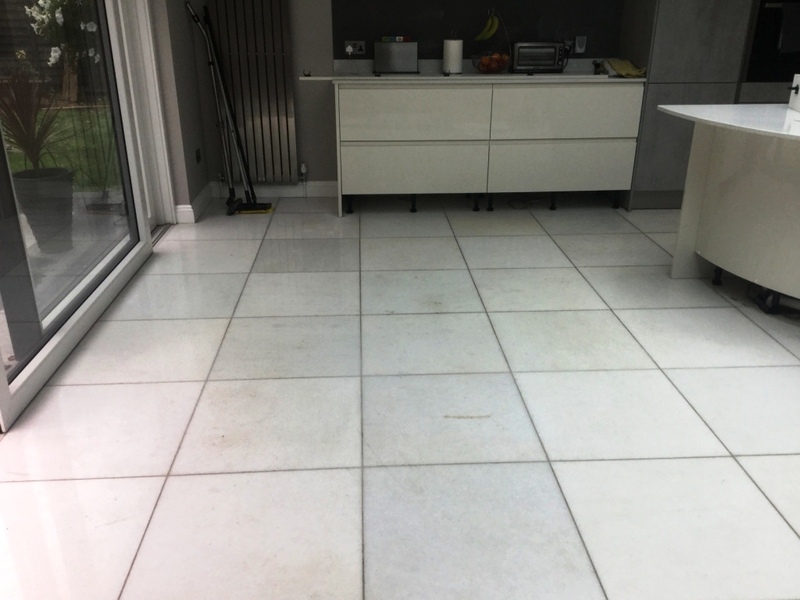 The customer’s choice to use a steam mop regularly had caused more harm than good, as the steam damaged the sealer and exposed the stone to ingrained dirt and stains. I was asked to restore the floor back to its original condition and provide advice on the correct cleaning techniques and products for aftercare. To begin the restoration, I used our Tile Doctor burnishing system, which consists of applying four different diamond encrusted pads to restore the sheen to the stone and rid it of any dirt. Starting with a Coarse grit pad to grind away the dirty layer, I subsequently moved on to the Medium and Fine grit pads to gradually polish the floor. Each pad is applied with water to help lubricate the process and the resultant soil is rinsed off after each pad application. Next, I cleaned the grout carefully using Tile Doctor Pro-Clean with a stiff grout brush, Pro-Clean is a strong alkaline cleaner that works really well on grout. The floor was left to dry overnight. Returning the following day, I applied the fourth and final burnishing pad which is a Very Fine 3,000 grit to achieve the best possible sheen. Water is liberally spayed onto the tile during the application of the last pad in what we call a Spray Burnish action. The final step of the restoration was to seal the tiles. 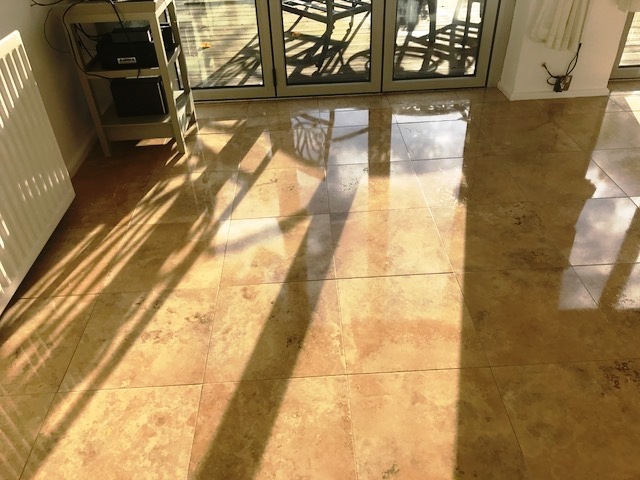 I did this using two coats of Tile Doctor Colour Grow, our impregnating sealer which not only protects the stone, but also rejuvenates its appearance and colour. I then gave the floor another quick buff with a white buffing pad for good measure. After completing the work, I gave the customer some advice on aftercare. 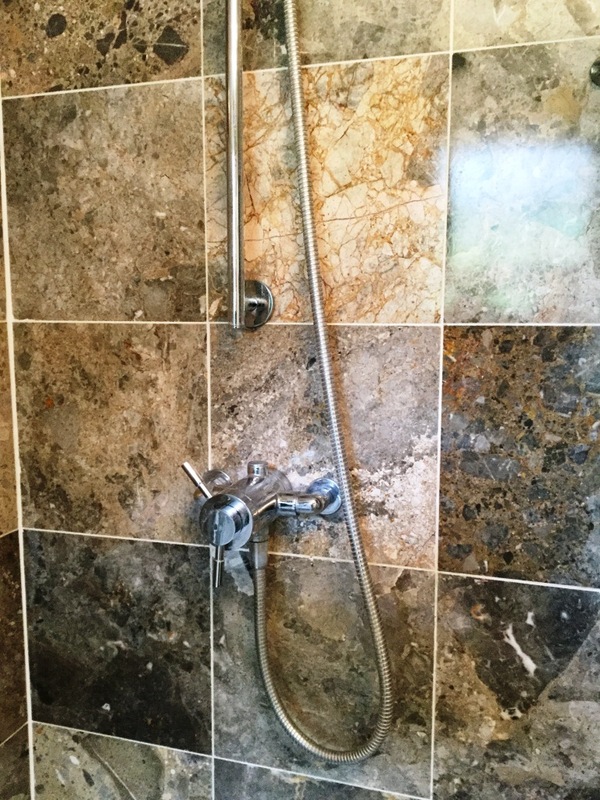 I recommended that she use Tile Doctor Stone Soap in combination with warm water for future cleaning as it is not only reliable, but also helps to maintain the natural patina of the stone. The solution should be gently mopped onto the floor. 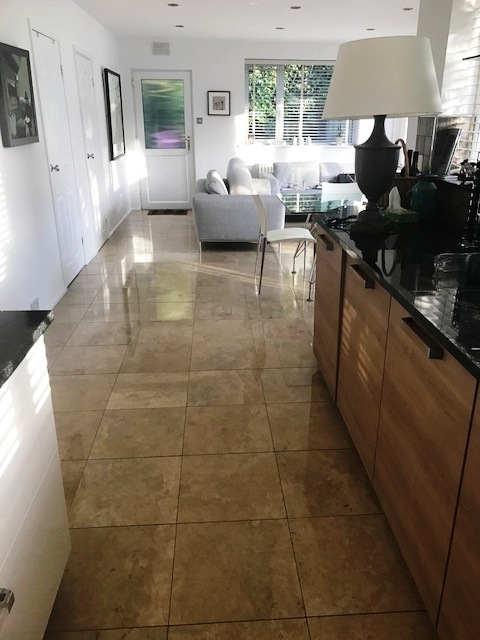 As you can see from the after photos, the work made a huge difference to the appearance of the Travertine tiles and the customer was very happy with the finished result. Marble tiles are a fantastic choice of stone for a shower cubicle because of its distinctive characteristics and quality. It can really add a luxurious feel and when used in a bathroom take it to the next level. 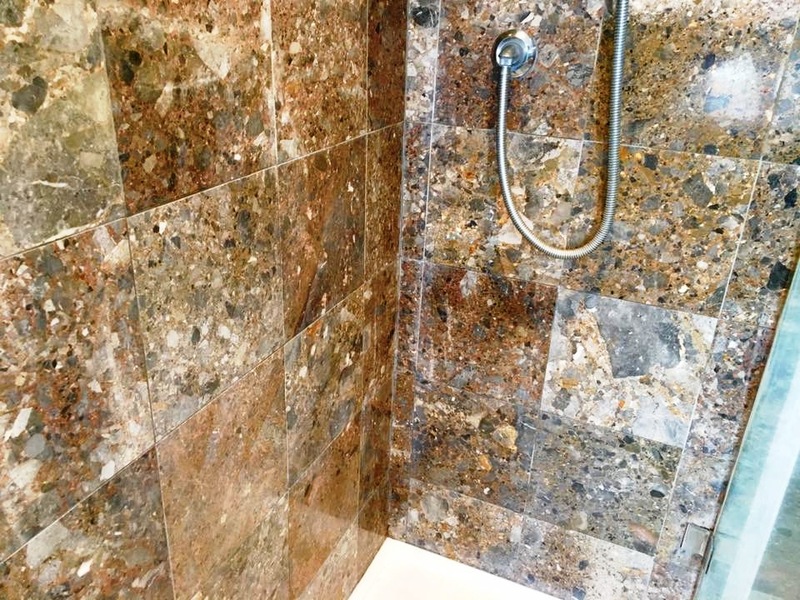 However, it’s extremely important to note that Marble like all natural stone is a porous and acid-sensitive material. It must therefore be cleaned with care using suitable products. This particular Marble tiled shower cubicle at a property in Leatherhead is a good example of this done wrong. 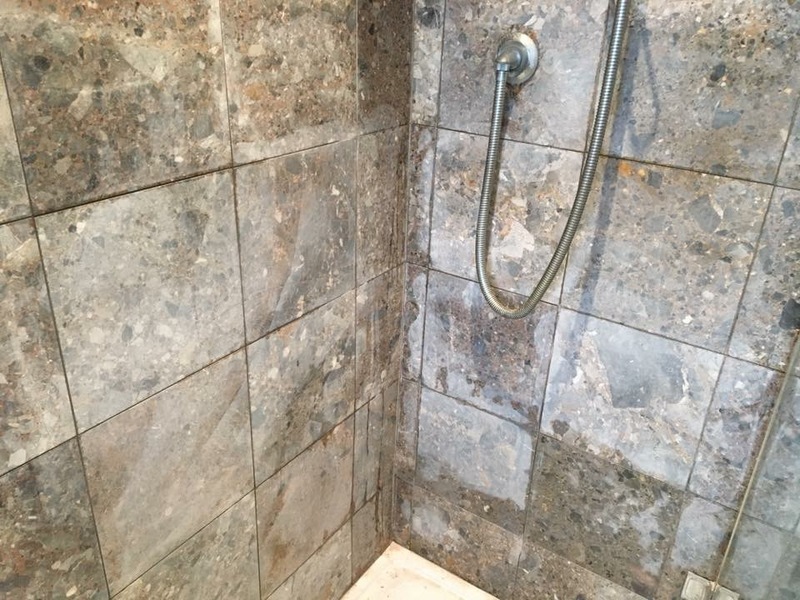 The owner had used an acid-based cleaning product to clean the stone, resulting in damage to the sealer and causing unappealing streaks to form. This type of damage can appear irreparable but, with the right combination of cleaning methods and products, it can be fixed. Once the old sealer has been removed, and the tiles have been cleaned, polished and re-sealed, they can look as a good as new. 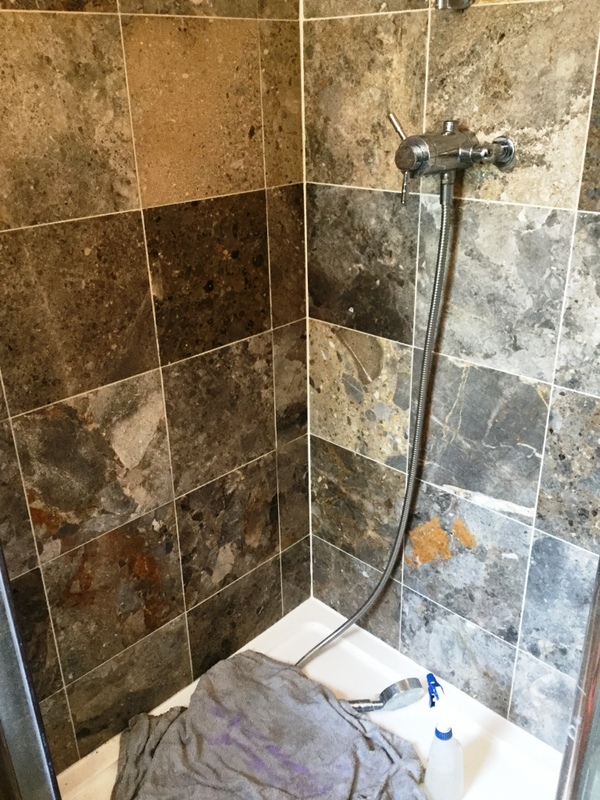 Here’s how I helped this customer restore the Marble shower cubicle. 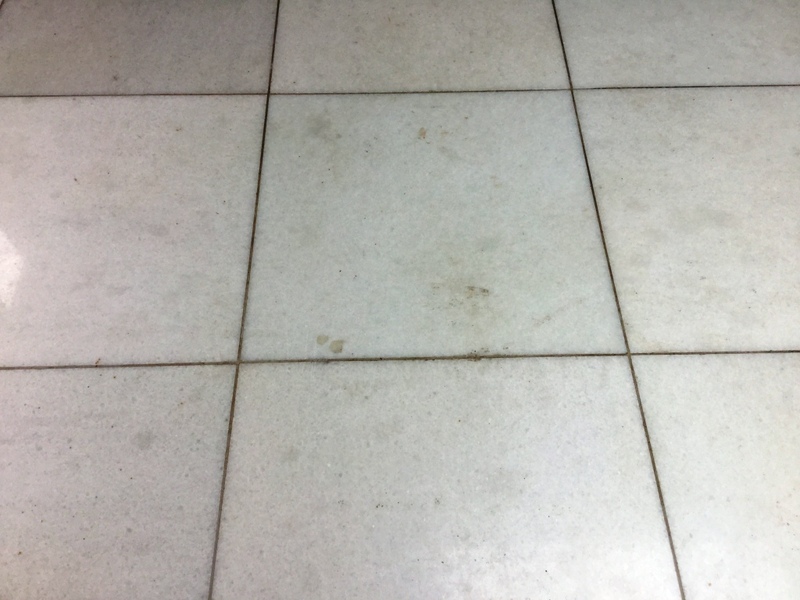 To begin the restoration, I scrubbed the dirty grout lines using Tile Doctor Pro-Clean, which is a highly reliable and multi-purpose alkaline-based product. I then rinsed the tiles with water to remove the traces of cleaning product. Next, I moved on to the polishing stage of the restoration – what we often refer to as burnishing. This involved the use of small six-inch diamond-encrusted burnishing pads applied with a hand buffer and with different levels of grit – ranging from Coarse to Very Fine. I started with the Coarse grit pad and worked my way sequentially through our four-pad system, polishing the stone with Medium, Fine and eventually the Very Fine pad to really bring up the polish. 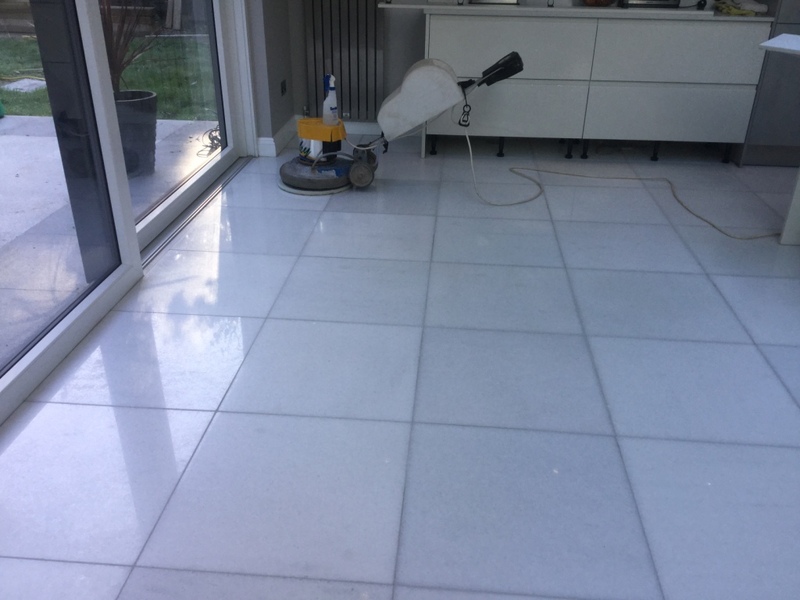 Once the shine had returned to the Marble and the damage had been removed, I re-sealed the tiles using two coats of Tile Doctor Colour Grow, a penetrating sealer designed to enhance the natural colours and patina of the stone. Once dry, I gave the tiles a final polish with a white buffing pad to put the finishing touches on the restoration.